What killed in this case is the attitude that all bicyclists must be accommodated on arterial streets, and it will all be not-so-bad when blame the inevitable deaths on car drivers. Young bicyclists should never be allowed to ride on an arterial street or a highway. Some miss the value of arterial streets. To watch traffic is to watch the economy. Money flowing, wealth building. Choke off traffic, and we choke off the economy, the wealth. We have the best transportation system in the entire world, which is one reason we have the most dynamic economy in the world. The role of bicycles must be kept in that context. Indeed, bicycle traffic is the flow of money also, but it’s well under 1% of that flow. We cannot replace car/truck traffic with bicycle traffic. What we can do of course is to maximize bicycle traffic when appropriate. It’s just not appropriate when discussing a 12 yo girl riding on an arterial street. 1) By what metric does the US have the best transportation system in the world? Have you looked at injuries or fatalities per capita or per mile in the Netherlands versus the US? 2) the Netherlands has acheived its traffic safety record because of a commitment to separate facilities for vehicles that differ in mass and speed. So, DW, I hope you take your thinking to its logical conclusion and advocate for separate facilities for people on bikes. ^By what metric does the US have the best transportation system in the world? Trips/person. It is far easier for an American to get a trip completed than in almost any place in the world, excepting only Canada. We get in the car, then go immediately where we want to go. 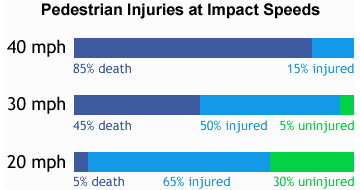 ^Have you looked at injuries or fatalities per capita or per mile in the Netherlands versus the US? Safety is a concern, of course, but achieving safety takes money. Money comes from traffic. Thus, safety which significantly reduces traffic ends up significantly reducing overall wealth. ^and advocate for separate facilities for people on bikes. Bikes will always be at substantial risk when a car is whizzing nearby. There is no way to pretend otherwise. Children should not be subjected to that risk, because their judgment has not matured. Isolated bike lanes cost money, lots of money. Money comes from car traffic. The mathematical conclusion is that we first need functional arterial streets, and then we can see if that generates enough spare cash to construct bike lanes. In the meantime, keep at least the kids out of high speed traffic. Calculating “best transportation” by trips per person says only that we travel more miles than anyone else by the least efficient (land use, fuel), most risky mode. The risk includes about 35,000 deaths per year from motor vehicle accidents and 3.5 million injuries, costing $100 billion a year. About 75% of that $100 billion is paid for by the public (Naumann, 2010). If we could travel those miles by train, deaths would plummet to fewer than 800 (Halperin, 1993). No wealth is generated on school commutes, but air pollution and traffic congestion certainly are. Meanwhile, the money that I use when shopping by bike every day is real money, not play money. Streets are a public utility and belong to all users. Restriping roads for bike/ped use is functional and cheap. I highly recommend “Fighting Traffic: The Dawn of the Motor Age in the American City” by Peter D. Norton, MIT Press, 2008. 1. Naumann RB et al. Incidence and Total Lifetime Costs of Motor Vehicle – Related Fatal and Nonfatal Injury by Road User Type, United States, 2005. Traffic Injury Prevention, 11:353–360, 2010. 2. Kopl Halperin, “A Comparative Analysis of Six Methods for Calculating Travel Fatality Risk.” Risk: Health, Safety, & Environment 4, 1993. The wealth is generated by the educational transaction. The point is, we _cannot_ travel those miles by any means other than car. That’s what makes automobile traffic so valuable to us. Students receive an education (or not) no matter how they get to school. In fact, studies show that students are more receptive to learning if they have arrived at school by “active transport”–that is, by walking, biking, or skateboarding. Exercise also reduces stress. On the contrary–we can easily and cheaply improve the infrastructure to enable safe bicycling on existing streets. In fact, just a 5% increase in commuter cycling causes a noticeable improvement in car traffic congestion. Everyone wins. ^Students receive an education (or not) no matter how they get to school. Agreed, and agreed, exercise is good. I road a bike to school myself. ^On the contrary–we can easily and cheaply improve the infrastructure to enable safe bicycling on existing streets. What we cannot do is replace all those car trips with bike trips, no matter what we do. ^In fact, just a 5% increase in commuter cycling causes a noticeable improvement in car traffic congestion. Everyone wins. Sold. Now all you need to do is to show how to replace 5% of car traffic with bike traffic, while leaving the other 95% of the car traffic to be happy with the improvement. It ain’t easy. The usual proposal is to basically get rid of 20% of the car traffic so that we can improve bike traffic from 1% to 2%. That’s a massive lose for the community, with a very small number of bicyclists being the beneficiaries. In effect, a tax of the many which benefits the few. Agreed, and this is where transit comes in–enabling people to bike to the bus, ferry, or train. Dutch cities with the highest rates of commuter biking boast only about 30% of trips entirely by bike, but they also have fantastic public transit. In Marin, we can already take bikes on GGT bus and ferry. I’ve been pleased to receive help with my heavy bike on the Sausalito ferry–very convenient. If you don’t consider wealth, you can show benefit from the elimination of car traffic. Japanese and European commuters have typical commutes over an hour one way, which leads to both economic losses to the community as well as a decline in quality of life for the commuter. Related, if you only measure safety, then you can show massive improvement by people staying in bed. There was a real reason why the horse powered transportation era was an era of far less wealth: people completed far fewer trips. Wealth is what is missing from all of those analyses. It’s as if wealth is guaranteed, and we can focus on other things without concern. The 20% reduction of car traffic eliminated when car traffic may be exaggerated, it could be that giving car space to bikes only eliminates 10%, but that 10% is never made up by bike traffic. Go out there and count cars vs bikes sometime. I believe the more pragmatic solution is to create dense zones where trips are short because distances are short. Again, you don’t cite your sources–for the U.S., Europe, or Japan. You don’t specify “wealth” for whom. You allege economic losses from long commutes by transit but leave out U.S. traffic jams that cause missed appointments, fouler air, higher blood pressure. My European in-laws are aghast at the distances Americans commute to work, and the amount of gasoline we waste. They enjoy relatively high density living and short commutes. But they cross those distances by bike and train (or tram), rarely taking a car. The twenty-somethings in the family don’t even own cars. Over the years, I have replaced most of my short car trips with bike trips. I save money on gas and car maintenance. I notice better heart-lung function when climbing hills and stairs. I recover faster from colds, despite having asthma. More wealth for me, less for Exxon, my car mechanic, and my doctor. My bike mechanic profits, slightly. Last year, I paid him $150 to rebuild my rear wheel around an obsolete hub, following about 10,000 miles of riding. My spouse now takes the bus to work (no parking fees = more wealth for us). He often walks home from a more remote stop, just for the exercise. Our daughter enjoys traveling home from college by Amtrak and GGT ferry–cheap, pleasant, and a chance for her to relax or do homework. Would you say my family is damaging the economy? Or would you say that we’re helping, by lightening our impact on the roads, air, and healthcare system, while supporting fuel-efficient, space-efficient public transit? Professionals in Marin have indeed gone out and counted bikes–many times. If you look at the NTPP 2012 report that I referenced, you will see how car trips go down in proportion to walking and biking going up, when good infrastructure is provided. You may be overlooking the potential of Novato’s excess road width. Narrowed car lanes slow cars without impeding traffic, save lives, and allow bike/ped facilities to be added. Re-zoning can help to create the denser mixed-use communities and shorter commutes that you advocate. ^If you and I climb aboard the bus (with or without our bikes), that’s two fewer cars on the road. So far, so good. But when (not if) we end up doing less business because it takes us longer to ride than to drive, the local economy suffers that loss of business. One measure of wealth is “does a person suffer any loss whatsoever when a plumber needs to be called”. If the person is renting, or the person owns but suffers, they’re on one side of the line. If they both own and don’t suffer, they’re on the other side. That’s the kind of wealth I think most Americans and surely most Marinites aspire to and largely acquire with persistence. It’s the kind of wealth built on one of the best transportation systems in the world.